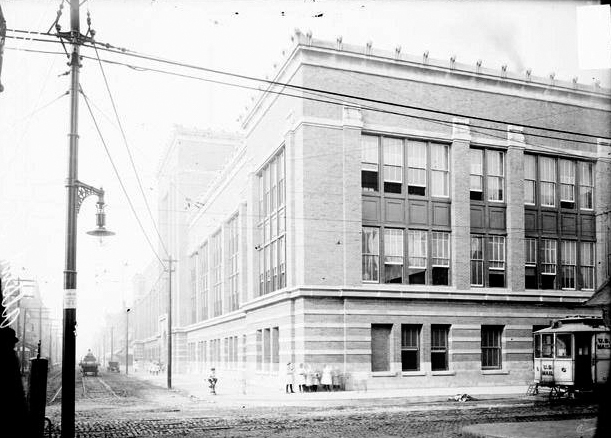 Located on Division and Sedgwick, the Albert Grannis Lane Manual Training High School opened in September 1908. The school was formally dedicated on Washington's birthday, February 1909 and is named for Albert Grannis Lane, Chicago Superintendent of Schools. As industrial education's popularity continued to grow through the years, and Lane added many new courses to its curriculum, Principal Bogan recommended that the school's name be changed to reflect all of the courses offered. In 1909 the school became known as the Albert Grannis Lane Technical High School. By 1915 the school was in full swing. The building was in almost constant use. Carpentry, cabinet making, and wood turning were offered to first year students. Sophomores were given extensive training in the fields of foundry, forge, welding, core making, and molding. Juniors worked in the most popular shop, the machine shop. It was equipped with 80 machines and 60 lathes cast and built at Lane. Seniors were given the most advanced shop, the electric shop. There they built motors, generators, transformers, and other instruments. Other classes, such as art, classical architecture, drafting, and English were offered to develop students' communication skills. The print shop was the best equipped high school print shop in America. It was equipped with the newest and most advanced equipment of the time. Its jobs included the 4 page Lane Daily, the 56 page monthly Tech Prep, and the annual 200 page yearbook plus other out of school jobs. At this time, Jack T. Nelson, a student, felt it was time for Lane to have a school song. He wrote the words and music of "Go Lane Go," making Lane one of only a handful of schools with an original school song. In 1929 a comprehensive music program was established at Lane. Chicago Symphony Orchestra director Frederick Stock and Superintendent William Bogan worked together in making up the new curriculum. By 1930 Lane had grown to a population of 7,000 students. To relieve the overcrowded conditions at the school, it was decided to build a new Lane Tech. Board of Education architect John C. Christensen began preparing plans for the world's foremost high school complex. On June 24, 1930 groundbreaking ceremonies took place at Western and Addison. (today's Lane Technical High School) The new building was a beautiful combination of function and art. Like the old Lane, it was designed to allow the teachers and pupils to work in a comfortable environment. On dedication day, September 17, 1934, 9000 boys marched from Cubs Park to the new school. Lane's new population required many new provisions. Classes had to be staged in three shifts, and commencement exercises were held at the International Amphitheater. World War II provided Laneites with many opportunities to show the ideals of Albert G. Lane and his school. Many war drives were carried out by Lane students. These drives provided the war effort with four Red Cross ambulances, a B-17 Flying Fortress, and over 3 million dollars in war bonds. Lane's 50th anniversary in 1958 brought a very important change to the school. America, fearing the Soviet space supremacy, became preoccupied with establishing a sound space program. To aid in the education of scientists and engineers, Lane assumed a closed admission policy. The school dropped its remedial courses and took only the students that would make the greatest contributions to American science. The year 1971 brought the most noticeable change in Lane's history. The Board of Education approved Superintendent James Redmond's recommendation to admit girls to Lane Tech. He cited a drop in enrollment and the lack of a technical school that admits girls as reasons for the change. The school was in a turmoil after this decision. Fifteen hundred Lane boys protested at the Board of Education. The general fear was that the school's quality would drop and within a few years Lane would be just another high school. Actually, the school's overall academic quality improved with the addition of girls. 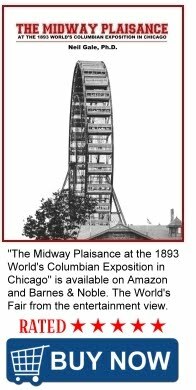 Born in a small, modest home in 1841 on what is now the corner of State and Van Buren Streets, Albert Grannis Lane made a permanent impression on Chicago and its people. Imbued with a strong work ethic, Mr. Lane took his first job at the age of seven. Through his initiative and hard work, Albert G. Lane earned an appointment as the principal of the Franklin School just after his graduation from high school. Thus, at the age of seventeen, he became the youngest principal in the history of the Chicago Public Schools system. In 1869, Mr. Lane became Superintendent of the Cook County schools where he made many innovations to improve the quality of the public schools. During his long career, Mr. Lane also served as Superintendent of the Chicago Public Schools and President of the National Education Association. Mr. Lane’s most cherished dream was the creation of a large high school dedicated to providing students with hands-on experiences in technical education while developing and enhancing their academic skills. Lane Technical High School is the realization of that dream.